The ACUVUE 1 day TruEye 90 pack is the bestselling product manufactured by global giants, Johnson & Johnson VisionCare. Like the name suggests, the pack contains 90 different contact lenses which can be used daily or infrequently. The ACUVE 1 day TruEye offers a wide range of attractive features that have made it a popular option with physicians across the globe. Some of these include strong UV protection, high moistness factor, a sleek design and a comfortable user experience. The ACUVUE 1 day TruEye 90 pack can be ordered online and is delivered to most locations within Australia. Silicone Hydrogel: The ACUVUE 1 day TruEye 90 pack is the first daily disposable lens manufactured with a silicone hydrogel. The inclusion of a hydrogel is important because it increases the rate at which oxygen is passed through to the eyes. The lens delivers over 95% of the available oxygen to the eyes, resulting in white and healthy eyes. HYDRACLEAR: ACUVUE lenses are designed with HYDRACLEAR; the company's revolutionary wetting technology. The inclusion of HYRDACLEAR technology enhances the moistness of the lens, offering the highest possible volume for a moisture rich wetting agent. This ensures that the lens stays constant moist, even when worn for long hours. Visible Tint: Each of the lenses within the ACUVUE 1 day TruEye 90 pack are visibly tinted which makes them easy to spot when they are in the container. They are also built with inside out marks which eases the handling process for new users. Strong UV protection: ACUVUE 1 Day TruEye 90 pack lenses offer some of the highest UV protection ratings available with disposable contact lens. It is tinted to shield users from UV-A radiation and residual UV-B radiation. Over 80% of the UV radiation from the sun is blocked from the eyes. Despite its efficiency, ACUVUE 1 day TruEye lenses are not designed to serve as replacement for UV protection eyewear. The ACUVUE 1 day TruEye 90 pack is designed for people who wish to avoid the discomfort of wearing glasses or extended wear lens. It is suitable for people with active lifestyles. It is also a suitable option for frequent travelers who wish to avoid the discomfort of carrying clunky lens care solutions or dealing with airport luggage laws. For the best performance, patients are advised to use a fresh pair or contacts each day. 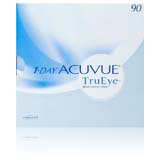 ACUVUE 1 DAY TruEye 90 pack is readily available online. Contact Lenses Online offers some of the cheapest price ranges available. Members of Australian private health funds can also enjoy additional discounts or rebates on their purchase. Before buying ACUVUE 1 day lenses, it is advised that people consult with an eye care professional. ACUVUE lenses are only available via a prescription. Visiting an optometrist will help in ensuring that people get the right fit for their needs. Wearing the wrong contact lenses can lead to potential eye difficulties. Patients who experience pain with their contact lens will need to have their vision reviewed. The 1 Day ACUVUE TruEye was the very first daily wear silicon hydrogel lens to be introduced. Since then, the lens has gone on to become a best selling product. The ACUVUE 1 DAY TruEye is a suitable choice for people with vision issues who wish to have these corrected. Its high oxygen transmission rate and wettabilty contribute towards its high performance. The ACUVUE 1 Day TruEye lens has been used by over a million different people and has earned consistent good reviews on the overall experience.